Almost everyone has at least once in their life converted a YouTube video or MP3. 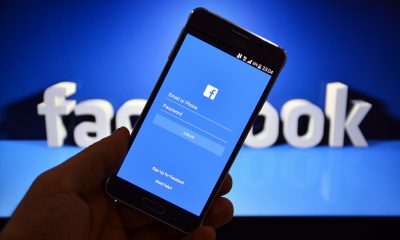 Billions of people want to keep their favorite videos and tracks with them at all times. Let’s have a look at the best YouTube to MP3 converters that will help us save YouTube music videos absolutely free. If you have a Windows PC or laptop, you might have already seen dozens of YouTube converters. New software appears every day, so it’s pretty difficult to choose a “right” one. 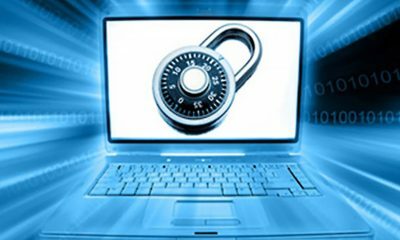 To prevent your PC from being infected by viruses, malware, and other damage, please read our article “How to choose a safe YouTube Converter“. 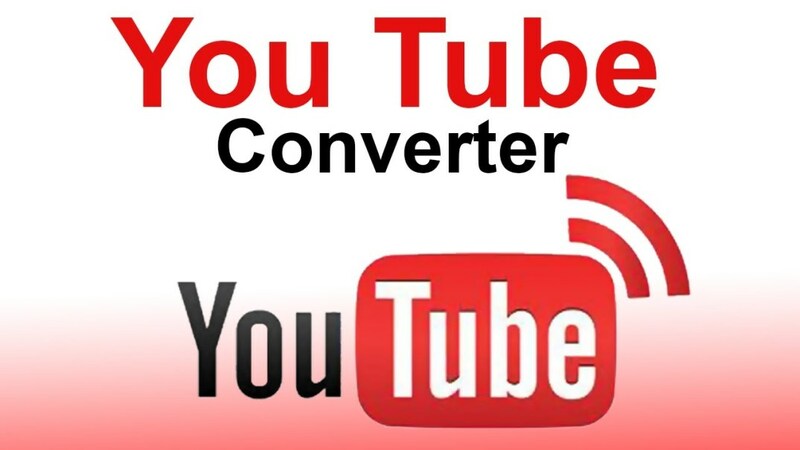 Download and install the free Freemake YouTube to MP3 Converter on your PC. 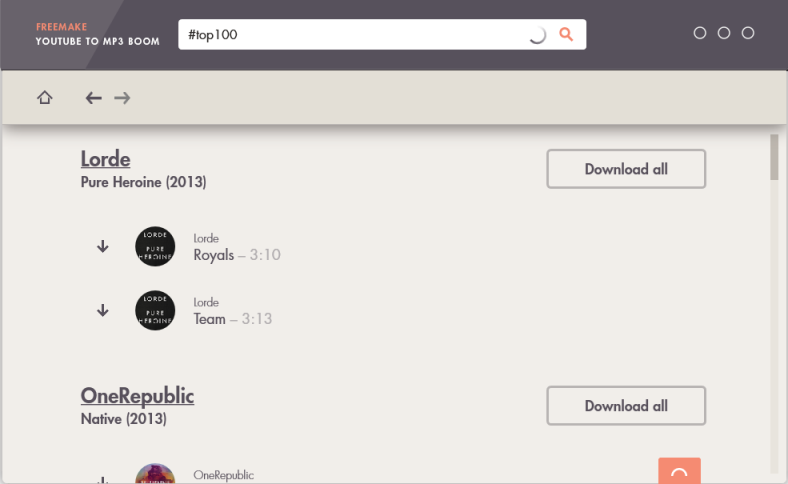 Type your music query in the search line. Alternatively, you may paste YouTube URL of the music video you want to get. Click on the Arrow sign to save as an MP3 track. As you can see, Freemake YouTube MP3 Converter lets you search for YouTube videos to convert to MP3 tracks right from the software. It means you don’t need to start your browser and go to the YouTube site. 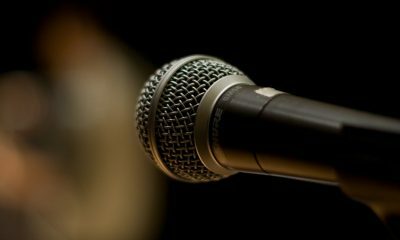 Just type a song, an artist or a band name and the software will provide you with a list of tracks. You will get the original track version, remixes, karaoke versions and so on. If you like, you can even convert a complete album to MP3 or all the tracks from the results list. 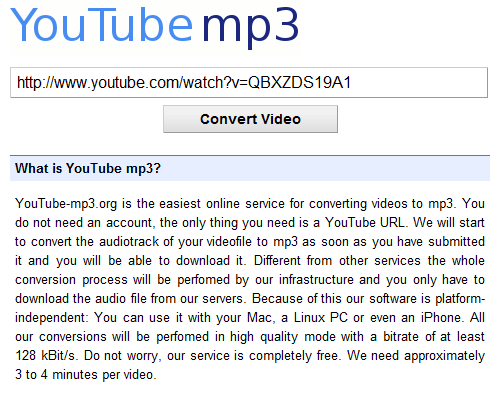 Freemake YouTube MP3 Converter converts all Youtube videos to MP3 music of the highest quality. Thus, you don’t need to select any settings. The software seems to have only one drawback – ads during the installation process. However, you can easily opt out of all the offers. Just make sure you’re paying attention during installation. Please note that this tool is for MP3 conversion only. It does not grab the whole video. 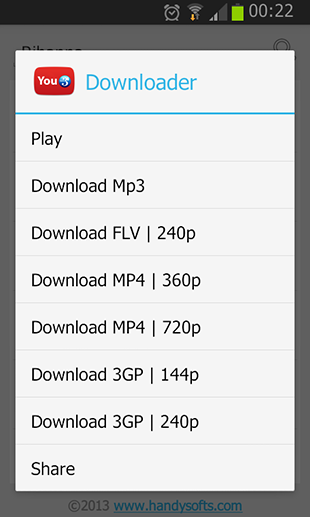 So if you need the entire file with both visual and audio tracks, get the app that can download YouTube videos in different formats and qualities including HD, Full HD, and 4K. Open YouTube-MP3.org in your browser. Go to YouTube and copy the URL of the video you want to convert to MP3. Paste the link into the special field on the page. Click the Convert video button to save the track. YouTube-MP3.org is great for those who don’t want to bother their heads about software installation. You can use it both on Windows and Mac computers. Just keep in mind that the music quality is not always good here. 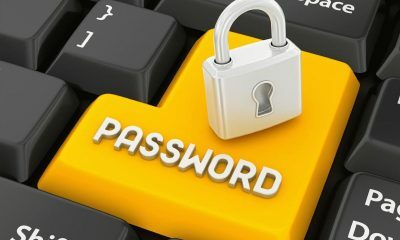 Moreover, you should be very attentive since some online services may infect your PC with malware. And of course, you’ll have to spend some time on searching for a necessary track on YouTube. Unfortunately, due to various legal issues, all the apps that could convert YouTube clips to MP3 files on the iPhone and iPad were removed from the AppStore. Don’t be sad! 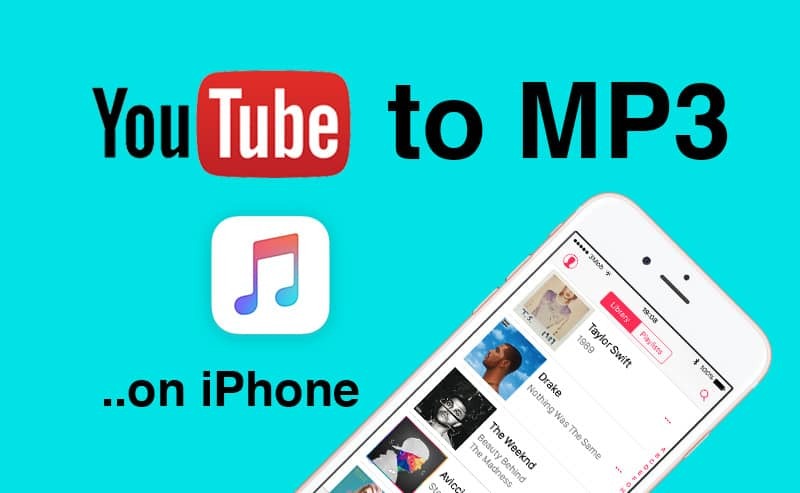 You can always use Freemake YouTube Converter to convert your favorite YouTube tracks to MP3 and upload them to your iPhone via iTunes. 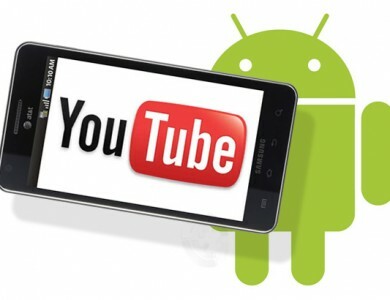 Since YouTube belongs to Google, it’s extremely difficult to find an Android YouTube Converter. Those that manage to appear in Google market, vanish in a couple of days or even hours. Thus, if you are an Android device owner, we recommend you using Freemake YouTube Converter to get MP3s from YouTube that you can use on your Android device. Please check this how-to guide for more information. However, if you really want to get a YouTube to MP3 app for your Android device, here are two options you can choose from. Please note, these are 3d party apps that you won’t find in the Android market. To install them, you’ll have to allow installation of non-Market apps. To do this, go to Menu -> Settings -> Applications and make sure “Unknown sources” is enabled. Now, let’s have a look at the apps. Type a song, an artist or a band name in the search line. In a couple of seconds, the song will be saved on your phone. If you wish, you may also get the complete video in a number of formats. Install the app from www.getjar.com. Search for the track you need by typing its title in a search line. Select the desired music video. Wait till the MP3 is finished downloading to your phone. Then get more MP3 tracks in the same way. 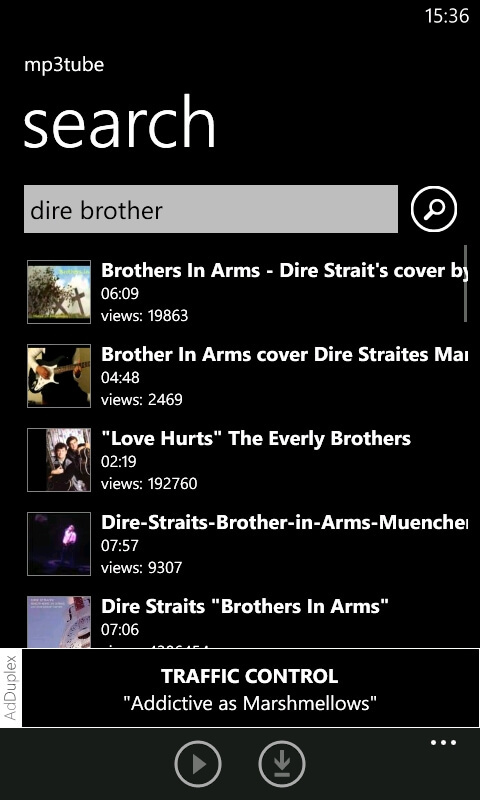 Install Mp3Tube from the Windows Store. Run the app and tap the Search sign. Type a song, a band or an artist name. Select the music video and tap the Download sign (arrow). The tracks will be saved within the app. Unfortunately, there is no way to export them to your default music player. Nonetheless, the app does its job and enriches your music library. What other YouTube to MP3 apps do you know? Share them with us in comments.